Guess what we got in the mail ... again? We love being famous! It seems that we're getting quite famous! 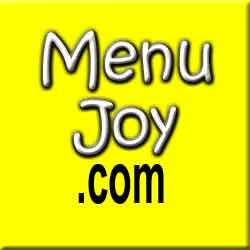 Since Mom and I have started this Web site, we've been offered free meals, been given complimentary coupons to try new items for our weekly Bites, and have even had our restaurant bill secretly reduced by a wonderful fan (thanks again, Liz). This week, the fabulous people at Phillips Candy House, Boston's oldest chocolatier, decided to send us a sample of their pumpkin pie fudge. What a great way to kick off the fall season! Mom and I love all things pumpkin, so when I spotted that obnoxious "sorry we missed you, a.k.a., we are holding your fudge hostage" tag from UPS on our security door, I flew into a rage. To make a long story short, after a few heated phone calls (we were home - they just chose not to ring the doorbell), I found myself standing at the UPS Customer Center in North Dartmouth waiting for our yummy treat. Once I got it home, Mom and I tore apart the adorably gift wrapped box to reveal a pumpkin pie-shaped piece of fudge with a chocolate-coated bottom. Heavenly! THE VERDICT: The aroma alone was enough for us to fall in love with this fudge. Besides the wonderful smell and adorable look, Mom was thoroughly impressed with the texture. Usually when you cut into fudge, it has a tendency to crumble apart, leaving you to pick out which oddly shaped sliver you would like to eat. This was NOT the case with this handmade brand. The fudge was just as smooth and creamy to cut as it was to eat. It wasn't overly sweet, which is great because Mom starts choking to death when she eats abnormally sweet candy (she's such a handful). The dark chocolate coating on the bottom - which I was afraid would be too overwhelming - was actually thin and crisp. Both Mom and I were amazed that the taste of the fudge was almost exactly like an actual piece of pumpkin pie instead of a candy. It was nicely spiced, with ginger being the most outstanding flavor. 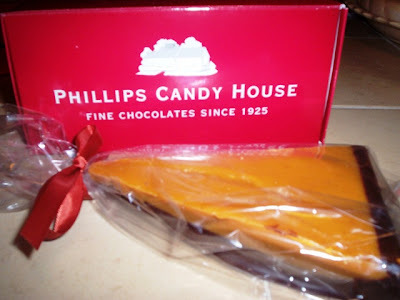 We were very impressed with the Phillips Candy House fudge, and I can't believe that they've been around since 1925 and we're only trying them now. Mom and I cannot wait to try some of their other goodies. Please visit their Web site for more information.